This Chicken Ranch Pasta Salad is perfect for a BBQ, a picnic or a lunch. 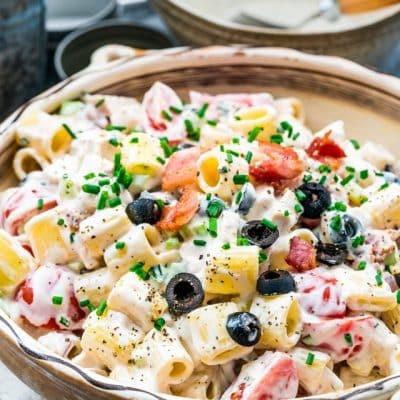 Loaded with chicken, bacon, tomatoes and olives and smothered in a creamy ranch, mayo and sour cream dressing, this will be your "go to" pasta salad this summer! In a medium size bowl whisk together the dressing ingredients. Cover with plastic wrap and refrigerate until ready to use. Cook the pasta according to package instructions. Drain in a colander and rinse it under cold water to stop it from cooking any further. Transfer the pasta to a large bowl. Add the bacon, chicken breast, celery, black olives and cherry tomatoes then add the prepared dressing. Toss well. I usually chop the bacon into small pieces before frying, I find it easier to fry this way vs frying the whole slices and then chopping it. Also I find it may fry faster this way. I used chicken breasts but feel free to use dark or white meat in this salad, totally up to you. I prefer chill this salad for a couple hours before serving. Store leftovers in an airtight container in the fridge, it should last anywhere from 3 to 5 days.